Most of us recycle newspapers, bottles, cans and cardboard packaging but some people go much further. 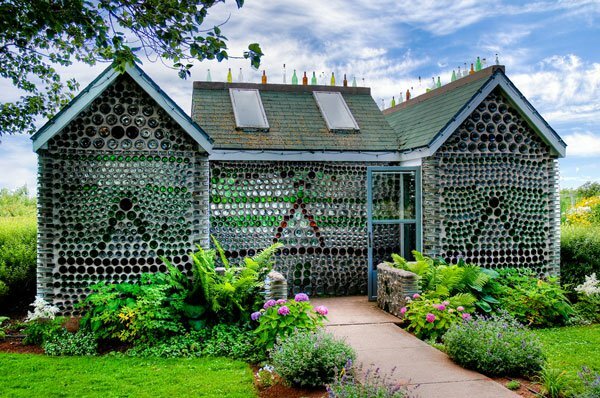 In the U.S. John Milkovisch, a retired upholsterer, built a house entirely out of beer cans and Édouard T. Arsenault from Prince Edward Island, Canada built a house out of 25,000 recycled bottles. Back in the 70’s a teacher and artist, Victor Moore, built the “junk castle” completely from salvaged materials and it only cost him $US500! More recently an attractive modern home was built by Architects in the Netherlands from recycled materials discovered in the area, they used recycled steel for the framework from an old textile mill and the wood from cable reels for the façade. In Japan a not for profit organization collects discarded dentures to reclaim metals like gold and silver, the proceeds from the sale of the metals is donated to Unicef. Incredibly, an airport in England collects used chewing gum to recycle into tyres, toys and other products. It is amazing the amount of materials and items we use that can be recycled and re-used. Kartaway will recycle most of the waste they receive, wherever there is a recycling operation available. Some of the items they receive and recycle at their Recycling Depot in East Brunswick, Melbourne are: green waste metal cardboard timber batteries electronic waste dirt brick concrete asphalt Being undercover, the Recycling Depot is accessible in any weather and being open 7 days makes it easy to drop off your waste. Alternatively, you can order a skip or bin from Kartaway and know that they will drop off and pick up the skip or bin and sort and recycle what you throw out. Builders or Renovators this is what happens to your building materials when you send them off in a bin or skip. 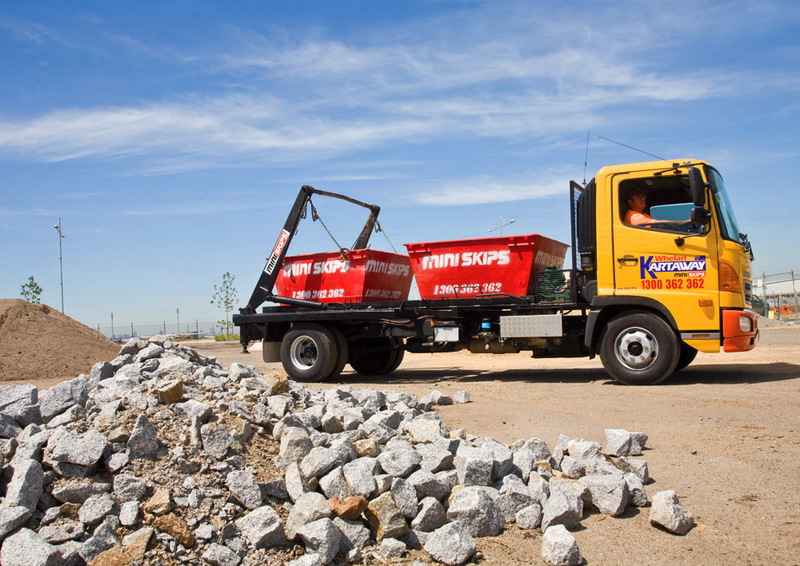 Kartaway Melbourne provide a large range of skips and bins and most materials can be recycled. Kartaway will also do the sorting for Builders, saving them valuable time. Recycling concrete is used for gravel and the base material for roadways. When recycled for these uses it saves on landfill, reduces gravel mining and reduces pollution. One ton of recycled cement saves 1,360 gallons of water and 900 kg of co2. Using recycled concrete has the added benefit of keeping construction costs down. Specialist facilities crush the concrete in crushing machines. As only uncontaminated concrete can be put through the machines trash, wood, paper and similar materials must be removed. The facility uses magnets to remove any metals, which are then melted down for recycling elsewhere. Once crushed other particulates are filtered out. These fines and aggregates are used within the building and construction industry. Bricks are either cleaned for re-use, crushed into brick chips, or crushed into finer particles. When cleaned they are re-used for buildings, landscaping or wall construction. The recycled brick chips are used for landscape material. The fine brick particles are used in manufacturing road-base, track and drainage material, fill sand or even to make new bricks. When truck loads of building and landscaping waste is dropped off at the Recycling Depots inevitably a large amount of soil is picked up along with the waste when it is loaded. Even this soil is not wasted, being put through several screens to produce a finer product which is sold on for re-use. Gyprock or Plaster board can be recycled very successfully, as the plaster powder produced is nearly as good as the virgin quality. The board is separated to create the gypsum powder and, where high quantities are available, this can be achieved quite efficiently. Recycled glass saves 30% of energy when used to make more glass products. It is totally 100% recyclable, able to be recycled over and over again indefinitely. Refillable glass bottles save on energy, using half the energy of a throwaway bottle. Recycling one glass bottle will save enough energy to power four hours of an 100 watt electric light. Aluminium cans when recycled to make more cans save a massive 95% of energy. Power your TV for three hours or run a 100 watt bulb for 3.5 hours from the energy you save when you recycle just one aluminium can. Save 74% in energy and reduce air pollution by 86% when steel steel is recycled into products. With a whopping 90% savings in virgin materials, this means that water pollution is reduced by 76% and mining waste is reduced by 97%!. Recycled steel cans are used to make more steel cans, structural steel, bolts and nuts and coat hangers. Kartaway support all recycling efforts, providing waste management plans to corporates, skips and bins to the public and a Recycling Depot in East Brunswick, Melbourne. They recycle most waste collected and their Depot is open 7 days. When it comes to recycling we have come a long way. Back in the 1950s a wonderful material called plastic was invented and it was so useful that it became a major material used in household items, building, packaging and manufacturing throughout the western world. Then it was discovered that plastics don’t break down, they stay around for hundreds of years. Landfills were becoming larger and larger with so much waste to dispose of as our consumer society threw out discarded products, buying the newer, better versions. Plastic had become a problem! Glass, metal and paper had been successfully re-used and recycled for sometime but plastic was being produced in ever greater quantities with no solution as to how to recycle this material. During the 1980s governments began to look at this in earnest and supported the development of industrial processes that transform the plastic into a useable item. With the development of PETE and HDPE plastics in the 80’s and 90’s plastics were suddenly able to be recycled. Consumers were educated about recycling and learned to recognise the recycle logo – three arrows making up a triangle. 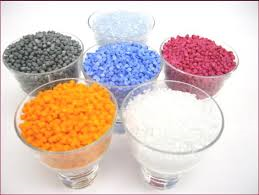 Requiring many more steps than metal, paper and glass to recycle, plastics need fillers, dyes and additives removed, require sorting and are then chopped into small pieces. These are cleaned, melted down and compressed into nurdles, which are plastic pellets. The nurdles are used in the manufacturing of new plastic products. Kartaway, a well known Melbourne based waste management business, excel in recycling. Providing bins and skips for waste removal from households, builders, corporations, shopping complexes, restaurants and educational facilities they are able to recycle most of the waste collected, including plastic. Their public Recycling Depot in East Brunswick will take nearly all materials, apart from putrifiable waste, and recycle it. Open 7 days, clean, affordable and accessible Kartaway have made it as easy as possible for the public to recycle. Prior to 1901 street rubbish collection was undertaken by private contractors. From that time on the council provided the service right up until the 1990s when it was returned in part to private contractors again. During the mid 20th century bottles were returned to the local shop and a deposit refunded. This encouraged people to recycle bottles in order to receive the refund. In particular, children loved this, keeping an eye out for any bottles lying around and collecting the extra pocket money. Newspapers were collected by the Salvation Army and Boy Scouts for recycling and used by fish and chip shops and greengrocers for wrapping and packaging. Baby boomers will remember with fondness cashing in their bottles and buying their fish and chips in newspaper. In the late 20th century reducing and recycling rubbish became a strong focus. Councils introduced kerbside recycling programs and the community took to recycling with vigour. Incredibly, by 2002 a quarter of the rubbish collected from households was recyclable. In 1977 Kartaway Rubbish Removals bin & skip hire was established in Melbourne. Expanding to a national company and establishing Recycling Depots, including one in East Brunswick, Melbourne, Kartaway are now leaders in recycling. The Recycling Depot at 32 Kirkdale Rd, East Brunswick was opened in 1997 and was the first public Recycling Depot open to the public. 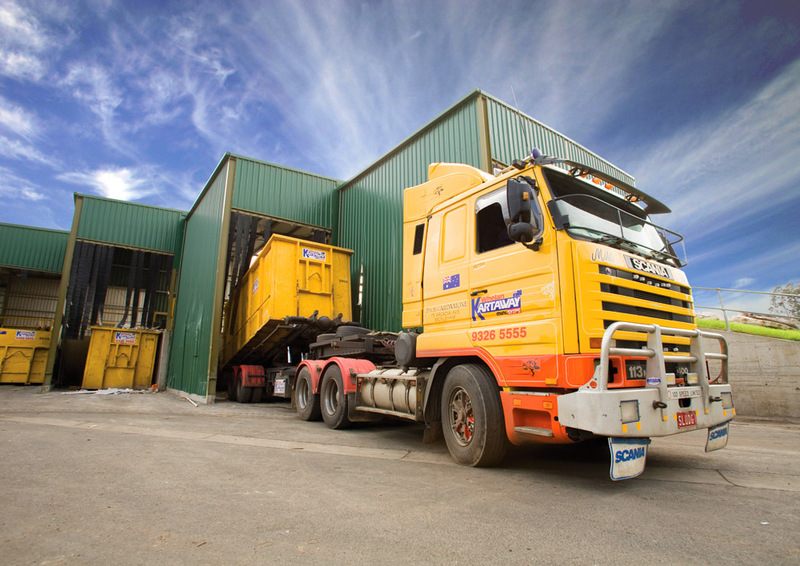 The Depot focusses on diverting as much rubbish from landfill as possible. It is able to accept green waste, metal, cardboard, timber, batteries, electronic waste, dirt, brick, concrete and asphalt. The gold rush during the 1850s brought many more people to Melbourne. And with the influx of people came an increase in rubbish. Pretty soon the city couldn’t deal with it’s garbage. It was an offence to dump glass, filth, dirt, rubbish or other matter of a similar nature according the Police (Town and country) Act 1854, however the city’s streets were piling up with refuse, including dead animals. Rubbish was being dumped in people’s backyards, in the streets and on vacant blocks of land. Fitzroy was the first municipality in Melbourne to establish a regular domestic rubbish collection. This was optional, residents could choose whether they wanted their rubbish picked up by the council. Recycling had already begun with Marine Store Dealers and Scrap Merchants recycling common items such as glass, metal and rags. The city of Melbourne gave residents free ‘iron dust boxes’ in 1880 encouraging them to leave them in their backyards for scavengers to empty. Rubbish dumps appeared in many of Melbourne’s recreational spots such as the Carlton Gardens, Albert Park Lake, the esplanade at Williamstown and St Kilda beach. Quarries and disused clay holes were also used as dumps. In the mid 1880s incinerators were built to dispose of rubbish across much of Melbourne. In 1890 James Paul Whelan set up a cartage company, which went on to become a demolition business selling the second hand material from the sites, and becoming the famous Whelan The Wrecker and thus the Whelan family entered the recycling business. Colourful Chinese millionaire Chen Guangbiao built his fortune through his recycling company, Huangpu Renewable Resources Utilization Group. Boosting his reputation in China with publicity stunts based on philanthropic acts or environmental messages he sold “canned air” in Beijing to raise awareness about ecological issues. He has also donated Chinese made cars to victims of anti-Japanese demonstrations who had their Japanese made cars smashed and provided relief to disaster areas in Japan and China, visiting the areas in person with aid materials. He and his wife changed their names to Low Carbon and Green in a bid to bring focus to environmental issues in China. Chen established his recycling company following the demolition of a stadium in Nanjing. He was not paid for the job and needed to find a way to make it pay. He was able to earn a profit by selling the used iron to iron and steel companies and recycling the cement blocks back into concrete (by mixing with water, cement and sand). He recognised an opportunity and found that all the construction waste could be transformed into at least seven types of building materials, such as landfill, red brick and building blocks. With China producing 2 billion tons of construction waste, it is a rich market for recycling. Kartaway began in Melbourne with humble beginnings as a cartage company in 1892. Established by James Paul Whelan, the company moved into the demolition business, selling second hand materials from the sites. His company, Whelan The Wrecker, became a famous icon in Melbourne. The company grew over the years, acquiring other businesses including mini skips. Nowadays the company is known as Kartaway and runs a public recycling depot in East Brunswick. Still run by the Whelan family,hiring bins and skips to the public and customising waste management programs for businesses and organisations, Kartaway Melbourne recycles most waste collected. The Recycling Depot at 32 Kirkdale Road is affordable, accessible and open 7 days a week. Chen Guangbiao’s love of publicity has seen him featured in the world news recently as he declares he will buy a share in the New York Times. The Whelan family will probably not follow suite on Chen’s latest venture!